Which speed is actually my download speed? What is the difference between the custom and HTTP download tests? What does HTTP x6 mean? Why do you run two download speed tests? Why does the HTTP test always last roughly 8 seconds? Why is the burst speed the same as the average speed? Why is the latency in the test higher than my ping? Do you use 1,000 or 1,024 in your calculations? For a long time your new tester did not link to my profile does it do that now? I have a tablet/phone that cannot run Flash or Java, can I run your speedtest? Why do you ask for the postcode and ISP? Why does the HTTP test run for a short while and restart? How long will the results pictures be available? Why is my result not appearing on maps.thinkbroadband.com? Why is the tbb result slow on my Mac or Linux machine? Why did you change from 2xHTTP to 6xHTTP? Why does the tbb result differ so much from the HTTPx6 result? Where has the old flash based tester gone? 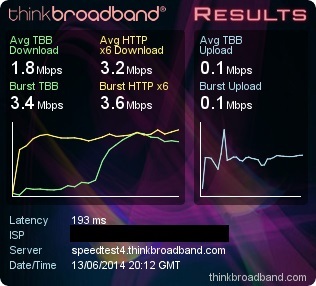 What does congestion look like on the speed test graphs? Can I download all my results to my computer for plotting in a spreadsheet application? Where have all my old speed test results gone? Will I be asked to rate my provider every time I run the speed test? My httpx6 result is a good bit slower than the tbbx1 result, why is this? The speed test warned me that I have a variable result that may impact HD video streaming? When my speed test completed it warned that I may have trouble streaming even SD video, why is that? The speed test warned me that my High Definition video streaming experience may be impacted, what does this mean? Why did the speed test warn me that my connection may not handle video streaming? The speed test has suggested I have an RWIN or congestion issue, why is this? My speed test result had a spike at the start that was faster than my actual connection speed, what is wrong? I was warned the HTTPx6 test during the speed test took longer than expected, what did I do wrong? The speed test suggested a spike on my HTTPx6 test result, what is going on? The speed tester has warned me that my HTTP result is low and I may have a software problem, what is wrong? The speed test has suggested my connection is suffering from congestion? I was warned that my connection may have congestion and that this could impact HD video streaming, will I be able to watch videos? The speed test warned me that I have a variable streaming result, what is wrong? My connection has no real problems and downloads everything, but you have warned me about a variable download speed, why? Your speed test has warned me I may have problems streaming some HD video? I have a dual stack (IPv4 and IPv6) connection but how do I force the speed test to use IPv4? The new testers throughput graphs are not as flat as the old tester? You are reporting a quality measure for providers, how do I find out the value for my test? The latest version of our speedtest actually displays six speed results, four for download and two for upload (some specialised versions may only show four figures. At the simplest level the figure you should normally quote is the Avg (Average) HTTPx6 figure. 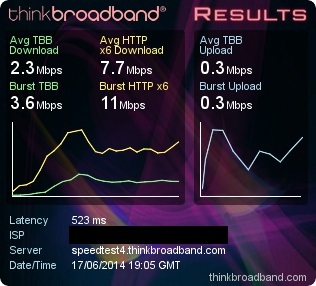 The average TBB figure on a broadband connection that is performing well should be the same or very similar to the HTTPx6 figure. The TBB figure will give you a good idea of how your connection performs with regards to streaming video. What is the difference between the tbb and HTTPx6 download tests? Our old flash tester used two different protocols, but in the latest version both the tbb (single thread) and the HTTPx6 (multiple thread) tests are both based around the HTTP protocol with the difference being that the tbbx1 test is using a single file and the HTTPx6 test uses a minimum of six downloads at the same time. Both tests take place over the standard TCP Port 80 and for those that want to specifically test a different port you can run the SSL version (TCP port 443) by visiting https://labs.thinkbroadband.com/speedtest When running the test directly on the labs site results will not link to your profile. The differences that a single download and multiple downloads will highlight are poorly configured TCP RWIN on your machine, or more likely whether there is congestion somewhere between your computer and the speed test server. This is referring to the fact that the HTTP test is based around a minimum of six downloads running at the same time. The use of multiple downloads should improve the saturation of the connection and give a result closer to the absolute maximum possible on your connection. By using so many connections it also helps guard against a single email or two skewing the results. Our old flash speedtest generated data dynamically for download, which meant the time for each test varied widely, and if the pre-test gave a false result the size of the payload would sometimes be inadequate to test the connection properly. Testing for a fixed period of time, allows the software to cope with a very wide variation of connection speeds and makes comparison between tests a lot easier. The software may for some connections vary the speed of the test as we are always monitoring for ways to improve the data collection, so if you are on a high latency connection and the test takes 2 to 4 seconds longer it may be that we are compensating for the long period before data started to download. The first download test we run is the tbbx1, where the x1 means we are downloading a single file and thus will show what your performance is like for streaming video. On a good connection with no congestion, traffic management or other issues the speed for a single download should match the multiple download test. The second test uses six downloads at the same time and in situations where Wi-Fi or provider congestion is a factor you may see the second download running a lot faster. If graph plot is very flat, it is possible that there is no discern-able burst speed, so the average will be used. This indicates that the connection was running flat out during the test and is an indicator of a good quality test. 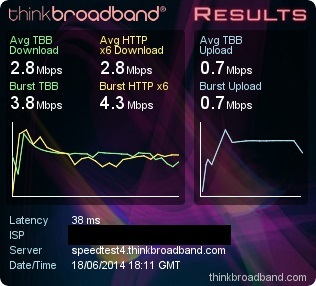 If the tbbx1 is totally flat and the httpx6 is varying considerably this is an indicator of congestion with your broadband provider or maybe even your own Wi-Fi. The latency in the test is measuring small packet TCP latency, which are larger packets than an ICMP ping, therefore it is common to see our speed test report a higher latency than the ping and traceroute tools. The key is that you want the latency to be stable between tests and for the stream of idle testing which can be seen on the latency graph when you click your analysis button at the end of the test. In 2012 we changed the testers to 1,000 for kilo in calculations which is common across other speed testers. This helps to ensure comparisons are valid with the many other tools. The flash speed tester has been deprecated after running along the new version for the last few years, and now that the new and improved website has been launched the new tester will link to your profile. Remember for the linking to work you must be logged in. When running the speed test we re-direct you back to a HTTP page, this is to ensure that on faster broadband connections the extra workload of the end to end encryption that HTTPS creates does not impact your speed test result. On a modern PC with a fast CPU this should not be an issue, but on 300 Mbps and faster connections we have seen older computers suffer slightly. If you do run a test and supply the postcode and ISP, it should be noted that the map page only updates once every 24 hours, though on very busy days the update can take longer so it can sometimes take 2 to 3 days. Postcodes for new build properties may not plot correctly, if sites like Google Maps have you new location and we do not then get in touch. The HTTPx6 test checks to make sure all the threads have started and if not it will re-start. This failover is also intended to ensure we can reliably test across multiple networks in the future. The two small PNG files that show your results can be referenced by the URLs shown after the test for a good many weeks. We endeavour not to delete them, but occassionally for we may need to, particularly if we see a high volume of tests. Therefore if you are wanting to keep the images as evidence for your broadband provider we suggest saving the images to local storage. On very busy days we sometimes see so many new results that processing takes a couple of nights rather than the map updating overnight normally. The most common reason for a result not appearing is that you are in a new property, and we cannot show those locations until the latitude and longitude for the new postcode has been acquired via Ordnance Survey who publish new lists roughly every six months. Why is the tbb result slow on my machine? The old flash based speed tester had various quirks and one was that on OSX some browsers flash implementation had a cap on the pure TCP socket implementation, the new speed test that does not use flash avoids this problem. If on the new tester your tbb result is much slower than the httpx6 result and the tbbx1 line is vary variable then it is likely you have congestion on your local Wi-Fi or at your broadband provider. A very small number of people have reported instances where their browser after closing it totally and reloading performs much better, therefore if you get an odd result try reloading your browser or even rebooting the PC. We released the tester initially with a modest two threads for the HTTP test, and after looking at many tests carried out over the first day or two, decided that for some connections more threads were needed to flood the connection with sufficient data to give the highest possible speeds. For some browsers and connections we may use even more than six threads now. There are many possible reasons, but the most likely issues are that the connection or the provider is experiencing contention. The HTTPx6 test by making six data requests can flood your broadband connection, where as a single download will go through more peaks and troughs if your ISP is busy, or something else is using your connection. Another possibility is that your computer may be ramping the TCP RWIN size very slowly, or it is set too low. The multiple requests of the HTTPx6 method help over this. We want to run both tests, so that when looking at the wider dataset we may be able to analyse the wider picture, on contention in the UK, or how prevalent computer issues may be. Where has the old Java and flash based tester gone? The java version we ran prior to 2012 is now history, and the Flash version is still available but is not under active development, if you wish there are two versions you can still run http://labs.thinkbroadband.com/flashipv4/ and http://labs.thinkbroadband.com/flashipv6/ which are dedicated IPv4 and IPv6 versions. The flash never had ISP detection for IPv6 and this is one of the new features in the web based tester we use now. In an ideal world we would love to maintain both the flash and web based tester but with the increasing variety of devices that people are using now a more widely available test that runs in any modern web browser we have decided should be our focus. The five years or running the two tests in parallel means we understand the differences between the two. With the plotting of the throughput measurements it is possible to see congestion on your connection, either from what others in your house are doing, or somewhere else on the Internet. 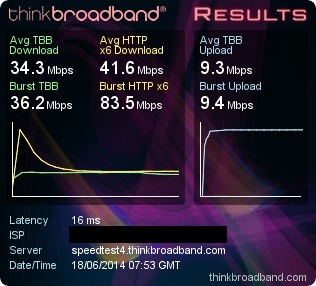 As you can see in the above test, the single thread TBB download is all over the place, but the HTTPx6 with its six downloads was able to almost reach the maximum throughput speed for the line (sync'd at 8.1 Mbps). The congestion was generated by watching a video stream on another device, but we seeing similar graphs from people who are seeing network congestion too. Yes, we have added this option as a number of our visitors like to retain their own speed test records. For logged in users you can visit your My Profile page, and at the foot of the Speedtest Results table you will find a 'Download results as CSV' option, which will allow you to save the results a Comma Seperated Value spreadsheet. We have not deleted any of the old data, it is still available to logged in users via the My Profile section, it is now located below the Flash Speed Test Results table. Once we integrate the new test results into the connection system you will be able to view a graph showing both sets of results. If you provide a rating after a speed test, we will not ask you again until the following month. If you skip the rating, rather than ask you again the very next time you run a speed test we will wait a week before seeking your opinion on your provider. NOTE: If you use the test on the same computer, but with a different provider we will ask you for your opinion. If you are using Firefox then a good chance that the problem is the Firefox Plugin-Container.exe. This container runs each plugin in an individual to reduce the chance of a plugin crashing Firefox, unfortunately this can affect speed test performance. The solution is to disable the Plugin Container or use an alternative browser. For help on how to disable the container one useful guide is here. Generally for HD streaming your connection needs a fairly reliable speed over 3 Mbps, your tbbx1 result was below this level and our multiple thread test was relatively slow too. This suggests that you may have trouble with video buffering and switching to a lower quality stream may help. Ensure your connection is not busy downloading or streaming on another device, since this can also create a similar looking speed test result. The speed test looks at the average speed of your connection and also how variable the results are. In this case with a single thread download under 1 Mbps it is very likely that your connection may struggle to stream even low quality video streams. If you were testing using WiFi we recommend you run the test again using an Ethernet connection, since WiFi congestion can slow connections down sometimes. We look at several factors when testing your broadband connection and if we believe the test we have just run looks like it may have issues when streaming a HD video we warn you. In this example the single thread test shows the connection may not manage a HD video stream, but the second test using multiple connections is generally OK. Since most video streaming is based around a single thread download we warn you. If you believe your connection should be faster double check that it is not slow WiFi or other devices using the connection that is the result of the slow tbbx1 speed. Generally any video streaming needs a connection that tests at 1 Mbps or faster, while the HTTPx6 result was better this does not generally help with video streaming. Severe WiFi congestion can cause a result like this too, so double check other devices are not using your WiFi. For the most reliable video streaming using an Ethernet based connection in the home is recommended. If the issue is congestion the two results will generally be better at off-peak times, so try running a test after midnight and before 3pm in the afternoon. Some anti-virus and malware protection suites inspect traffic coming over the Internet onto your computer and this can result in a burst effect. Generally over a length of time this burst settles down and a good average speed is produced. We know that some versions of the Kaspersky AV suite cause this behaviour and as such this does not mean there is anything untoward with your connection. We just highlight the issue as many people see it and get confused. You have done nothing wrong, we simply expect the second test that uses multiple downloads to complete within a certain time window. On some combinations of browser and operating system we have seen the test take slightly longer than expected. Generally the graphs show no evidence of the test taking too long, but if the test stalls and takes 16 seconds or longer you may see an oddly shaped graph. While some AV software causes high peaks at the start of the test, we have seen some people with tests that start high and then decrease in speed and in a manner that does not suggest congestion. The exact cause for this problem is not known, but we believe a combination of AV software and possibly a slow PC may be to blame. Now our database is spotting this issue we hope to profile the problem and find the common factor to overcome this odd behaviour. 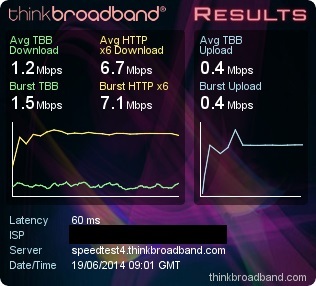 Our HTTPx6 test should usually be as fast or faster than the tbbx1 test, because it uses multiple downloads to combat the effects of congestion, but in some cases such as yours and the example shown below, the HTTPx6 result is low. The causes are sometimes your AV software that is slowing down the throughput while it inspects the traffic to ensure it is not dangerous. On some older computers or ones with limited memory we have seen the extra load of doing six tests slow things down too. This situation can also arise with some KC FTTH based connections, particularly where you are on one of the slower speed packages. Since it appears that the rate limiting used to cap the product speed can give odd results e.g. sample KC FTTH speed test. This effect may not be visible with other testers since they show you less information. During a speed test we look at how variable the results are, as well the absolute speeds. When people are warned about possible congestion it means we have seen a variable result for both the tbbx1 and HTTPx6 tests. If you run a speed test outside peak hours and you do not get this warning, the suggestion is that the provider may just have been busy when you previously ran your test. Another possibility is that someone in your home started a large download shortly after you started the speed test. A single speed test is a snap shot of how your connection performed and in the example shown here, the connection should still be able to stream HD video, but if your speeds a slightly lower and more variable you may actually find HD video is buffering. Since video streams are sourced from many locations on the Internet it is impossible to give definitive advice, but if you are using WiFi we recommend seeing if an Ethernet connection will give you a better result, i.e. less variability. 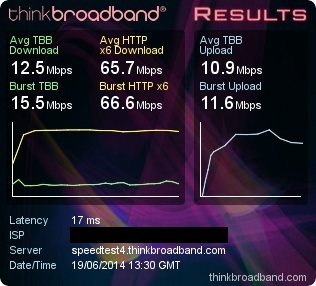 Our speed test carries out two main tests, the first which is the tbbx1 result in your case looks to be a lot more variable than the HTTPx6, suggesting congestion at the ISP or over the WiFi link in your home. Streaming video usually uses a single download of data which is how our tbbx1 test works, so if your speeds are all over the place during the tbbx1 result, it is likely that video streaming may be marginal. If your average speed is above 10 Mbps, then the impact is likely to be only noticed if you stream at the very high quality levels e.g. 2K or 4K video. Our speed test monitors how stable the speed is during a test and in your situation while you have great speeds, there are indications that the speed varies a fair amount during the course of the test. In your case and the above example since the average speed was above 20 Mbps it is very unlikely that you will have problems with HD video streaming. In the future once 4K video streams become more common you may start to see more buffering. We recommend trying another speed test outside peak hours, and if the warnings vanish and the lines are more stable then it would suggest that it was just a busy time of day when you did your test and this is the nature of the Internet where resources are shared. While most speed tests only produce an average or burst speed our speed test looks deeper into how your broadband service is performing and we noticed some variability in your speed during the test. This should be noticeable by a more wiggly line for the tbbx1 result and a flatter line for the HTTPx6 result. If the low points of the tbbx1 test are above 5 Mbps then you should have no problems streaming HD video, but if the variation is wider you may see the odd bit of buffering when watching a long film. If you are using WiFi you may want to consider repositioning your WiFi router to optimise the speeds for where you usually sit and stream video content. Our speed test automatically defaults to IPv6 if it detects IPv6 on a connect, for those users who want to force an IPv4 based speed test on their connection you just need to wait a short while until later in May 2017 when we provide an additional version of the new speed test that forces the test to use IPv4 even when IPv6 is available. Buffer bloat is a problem that can arise from broadband routers that are over optimised by hardware manufacturers to ensure very fast speeds are possible. If you have a Grade A for both download and upload you have nothing to worry about, since A is perfect with the worst grade being E.
Buffer bloat is measured by comparing the latency of the connection when downloading and uploading with the latency when your connection was otherwise idle. On routers with very large TCP buffers the latency requests get held up if you saturate the connection in either the download or upload direction, hence why if your cloud backup is running flat out you will find that web browsing is a lot slower. Some broadband routers allow you to implement Quality of Service parameters that reserve a little bit of download and upload speed so that small packet requests are not unduly delayed if the connection is otherwise busy. A great example of why you want to do this is if you use Voice over IP and don't want a big software update to downgrade the quality of the VoIP call. The new testers throughput graphs are not as flat as the old tester?? The old flash test would give extremely flat graphs on good connections, and while this is still true for the new tester there is a little more variation especially on the upload testing. This is down to packet sizes and some limitations of web browsers but in testing the graphs due closely match monitored throughput using other tools, the flash system used to have a slight tendency to over smooth the graphs. 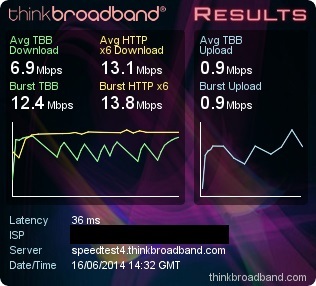 Our broadband tester if you delve into the detail that the Analysis button provides will compare your speed test to others in your part of the UK and also how you compare to others using the same type of connection technology. Monitoring this score can be useful when trying to locate a wireless access point in the ideal position in a home as a if you can get a grade A score and your median (average) speed is high enough you should be able to download at very close to that average figure all the time. If you have a D,E,F grade score than the variations mean if you are streaming video there is an increased risk of buffering.